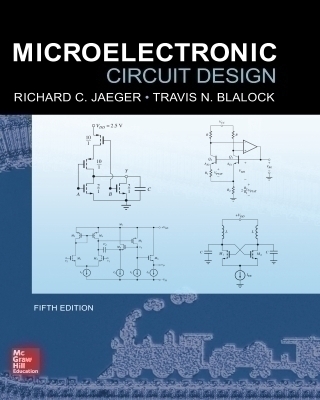 Richard Jaeger and Travis Blalock present a balanced coverage of analog and digital circuits; students will develop a comprehensive understanding of the basic techniques of modern electronic circuit design, analog and digital, discrete and integrated. A broad spectrum of topics are included in Microelectronic Circuit Design which gives the professor the option to easily select and customize the material to satisfy a two-semester or three-quarter sequence in electronics. Jaeger/Blalock emphasizes design through the use of design examples and design notes. Excellent pedagogical elements include chapter opening vignettes, chapter objectives, ÃƒÂ¢Ã¢â€šÂ¬Ã…â€œElectronics in ActionÃƒÂ¢Ã¢â€šÂ¬Ã‚Â boxes, a problem-solving methodology, and "Design NoteÃƒÂ¢Ã¢â€šÂ¬Ã‚Â boxes. The use of the well-defined problem-solving methodology presented in this text can significantly enhance an engineerÃƒÂ¢Ã¢â€šÂ¬Ã¢â€žÂ¢s ability to understand the issues related to design. The design examples assist in building and understanding the design process.